The site of $12 billion POSCO project in Jagatsinghpur district of Odisha saw violent clashes on December 14 when the state administration resumed construction of a 12 km coastal road linking the steel plant to the captive port. 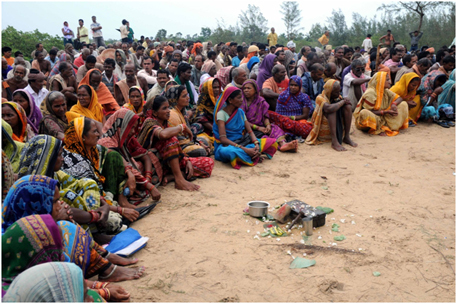 Villagers opposed to POSCO clashed with project proponents and workers of a private construction company, Paradip Paribahan, leaving one person dead and injuring 25 others. According to Prashant Paikrey, spokesperson of POSCO Pratirodh Sangram Samiti (PPSS), an outfit spearheading protests against the project, “3,000 people from Dhinkia, Gobindapur and Patna villages decided to oppose the construction of the coastal road.” The administration is trying to push for construction despite the violence which erupted on September 26 at the same place,” he adds. “How can the government start construction when it has not completed the land acquisition or renewed the memorandum of understanding (MoU) with the company?” he asks. The government is yet to acquire 55 per cent of the land required for the POSCO plant and port sites. Since June 2, 2011, residents of the area have been resisting land acquisition by creating human barricades and guarding the entry to their villages. The MoU which the Odisha government signed with POSCO expired on June 2010 and has not been renewed since. Interestingly Paikrey has been named in the FIR lodged with the police for the December 14 incident along with N Narayan Reddy, an ex-legislator of the state assembly from the Communist Party of India (CPI). Reddy was spearheading protests in absence of Abhay Sahoo. Last month, the police arrested Abhay Sahoo, CPI leader and president of PPSS on criminal charges. Residents of Dhinkia village, the epicenter of the protests, claim 167 false cases have been registered against them to restrict their movement resulting in an internecine conflict. “The government is sending a reign of terror by arresting leaders of the agitation. If one goes by the relief and rehabilitation (R&R) policies at the Central and state level, no project can start construction before R&R is completed. By clearing the forests and attempting construction of the coastal road the government has repeatedly violated its own rules,” says Madhumita Ray, programme manager at ActionAid who has been tracking developments at Jagatsinghpur. In January 2011, the Union environment ministry gave a conditional clearance to the POSCO project, even after two successive committees appointed by the environment minister stated the project violated the Forest Rights Act (FRA, 2006). After the clearance, the state government has tried forceful land acquisition and construction in the project area.